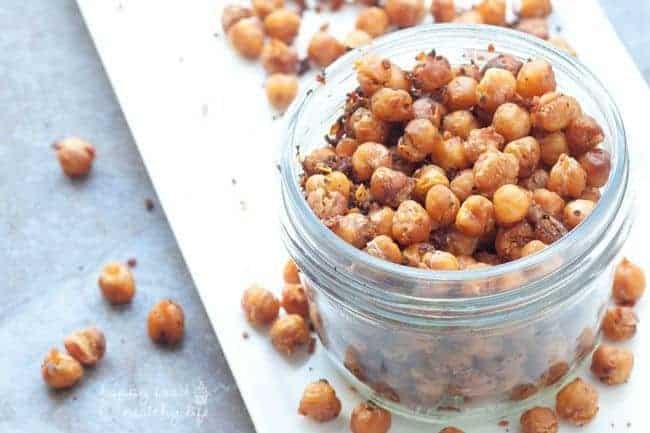 These Roasted Taco Chickpeas are full of your favorite southwestern flavors, compacted into a crunchy, addicting, and healthy vegetarian snack. This is one of those recipes where I second-guess myself because it’s so dang easy and I feel stupid for sharing it. But guess what – I know you… You’re a busy woman who is looking for easy also. You want snacks that you can just grab on your way out the door. Snacks that don’t have a billion hard-to-find ingredients or take a whole afternoon to make. This is the one for you! Sure, there’s an hour where it sits in the oven, but you wanna know what I think about that hour? Cause here’s the thing. Often right after I throw something in the oven, I think to myself, ‘oh, well, I can just browse Pinterest or Facebook to kill time until it’s done.’ Um, no. Set the timer on your phone (at least 5 minutes before your oven timer so you can make sure nothing’s on the verge of burning) and go do what you need to do to better yourself and your well-being. Just last week, I put dinner in the oven, and yes, it was only a 30-minute bake time, but that’s all I needed. I hadn’t worked out yet that day, so I hurried up and put on my workout clothes and got right down to business. Just 10 minutes on the bike and 20 minutes with my dumbbells was all it took to get a good sweat on and make me feel productive and like I was taking charge of my health. So my point is, we get these moments in our lives, and we must notice them and use them wisely. Whether it’s the internet, a tv show, a trash magazine, or whatever the distraction may be, we often fill our little moments with these things that don’t exactly match up with the goals we’ve made for ourselves. Our goals to get healthy, get fit, get in shape, or whatever your personal goal looks like. Next time you have an hour (like when you throw these babies in the oven) and you start thinking about what you’re going to do with it, I want you to ask yourself if it’s in line with your priorities. Your favorite taco flavors, compacted into a crunchy, addicting, and healthy vegetarian snack…. 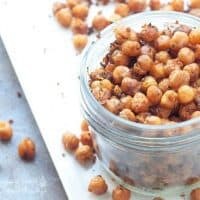 On a clean dish towel or between several paper towels, dry rinsed chickpeas completely. Place in a bowl with taco seasoning and olive oil. Toss to coat. 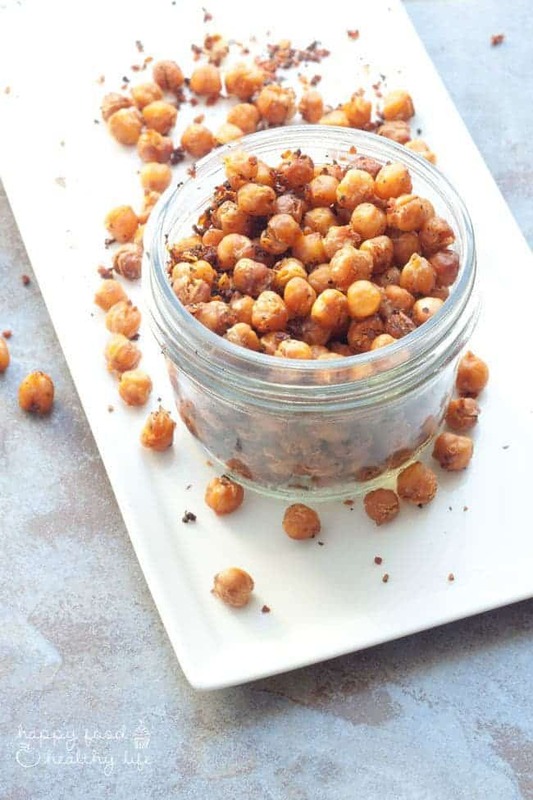 On a baking sheet sprayed with non-stick spray, spread chickpeas in one even layer. Bake in preheated oven for 55-60 minutes, taking out halfway through and shaking the sheet so the beans cook evenly. At the end of the baking time, the beans should be dried, dark brown (but not burnt), and crispy. Remove from oven and let cool completely. Once cooled, they are best eaten within a day in order for them to stay crispy. 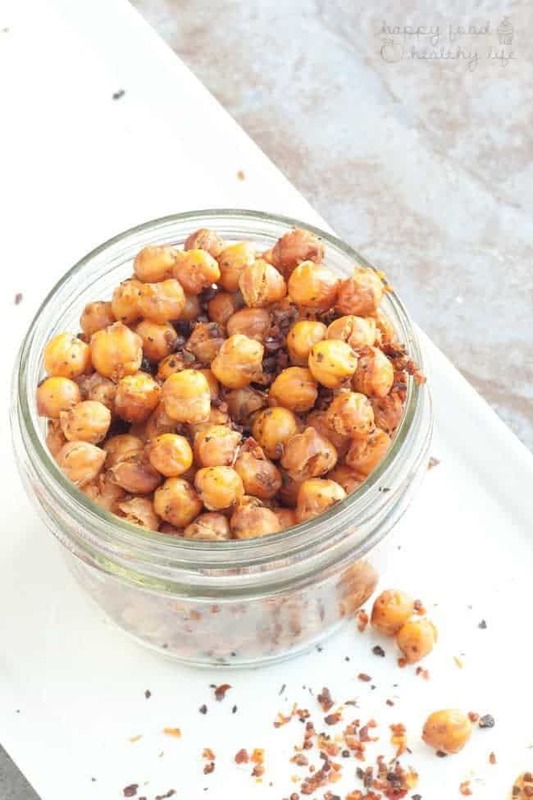 Looking for more quick and easy snacks? Thanks Yvonne! So happy to inspire! 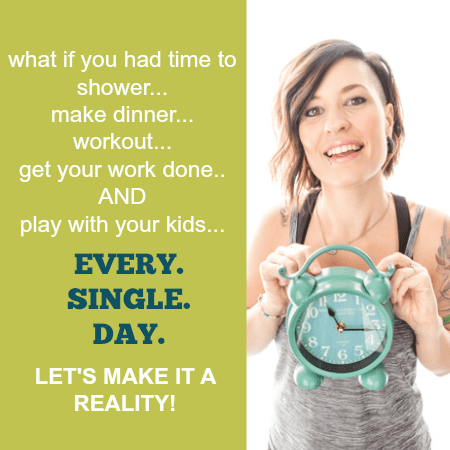 I realized how much time I used to waste just while I’m waiting on something to happen – whether it’s dinner to be finished or my kiddo to finish something, I should be using that time wisely for my health.